Horses are magnificient animals with a long association with humans.They present strength, energy and grace. So it's easy to understand why so many people love horses. Horsehair has been and continue to be used for many things. The hair can be easily spun into long lines, braided and woven. People used long lines of plaited horsehair as fishing lines for centuries. They were used for fishing gloves too because of their insulating and waterproofing properties. Horsehair was also used in crinolines, a stiff fabric where the weft was horsehair and the warp, cotton or linen. Horsehair plaster, a kind of wallcovering can be found in some older buildings. It's still used for the bows of stringed instruments and in some art brushes. 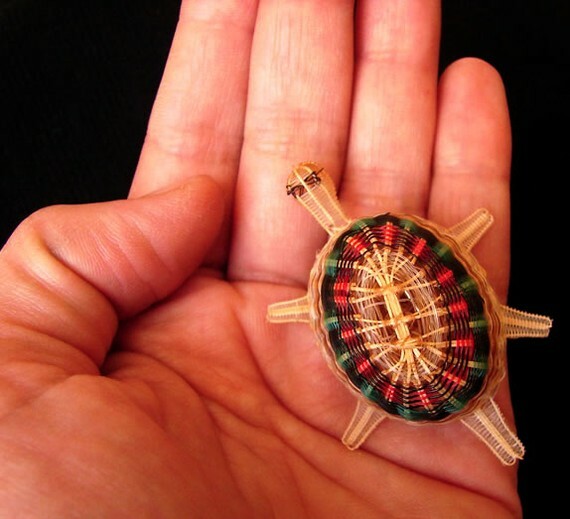 Craftsmen also use horsehair as accents in pottery and basketweaving. It should not be a surprise to anyone that it's used for jewelry too. Shown here are featured designers from Etsy who make amazing horsehair jewelry. They are located in different parts of the world which is reflected in their techniques. 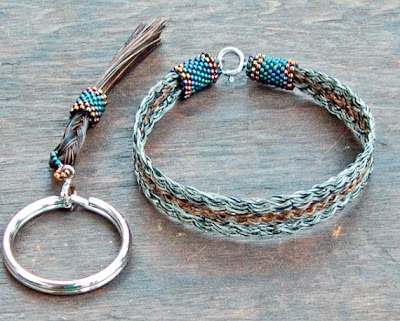 The first three exquisitely woven designs above are by Bea Bánya of BBHorseHair Jewelry who uses an old European-Hungarian horsehair jewelry technique to create modern interpretations. If you look carefully, she uses only horsehair and crystals. There are no cords or leather involved! Another outstanding artisan is PurpleToedGypsy who made this Native American style horsehair medallion. 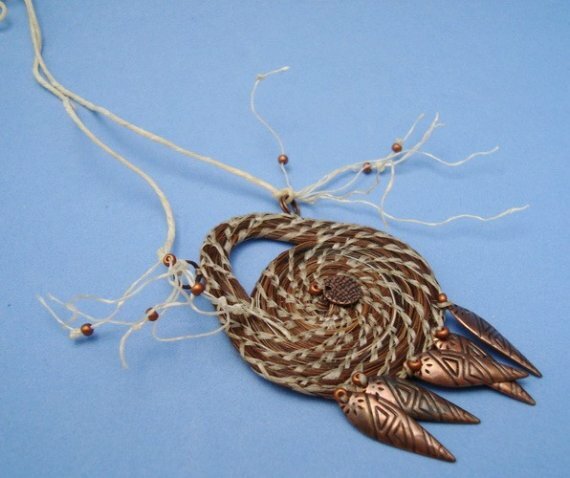 The horsehair coils are bound with cream colored sinew. 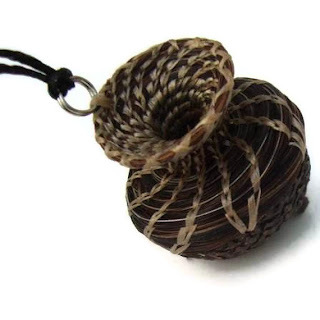 Her horsehair chime necklace is a wonderful mix of an acorn cap and horsehair with a jingle bell trapped inside! This design shows off her weaving skill. Horsehair can be also be dyed. This delightful turtle inspired horsehair brooch is by Natalia Saldias from Chile where they also have a horsehair crafting tradition. 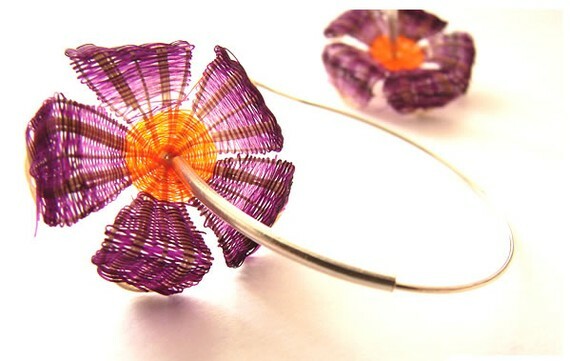 Natalia is also a metalsmith. 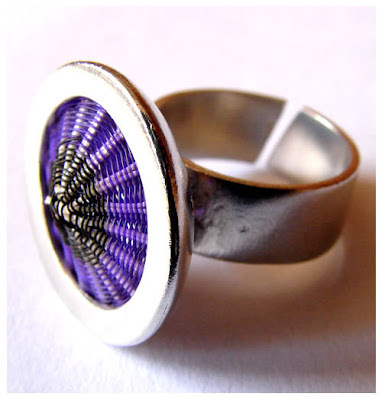 Her ring design below incorporates purple dyed horsehair. Natalia's horsehair flowers are also wonderful. Melinda Sims and her husband of Rock Creek Horsehair are the artisans behind this multi-colored hitched horsehair bangle. A metal core is used. 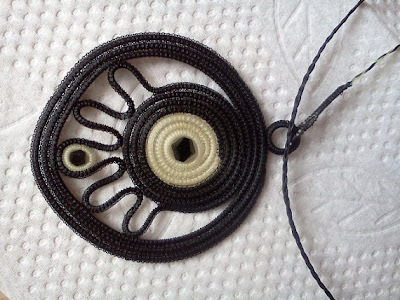 Hitching is a macrame-like method. 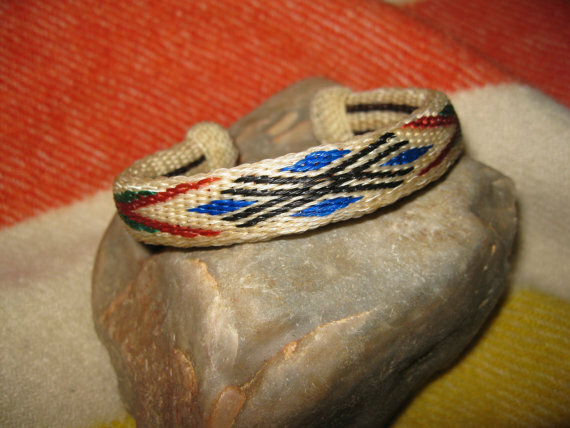 Twisted strands of horsehair called pulls are used in the knotting process. Barbara Volk of Spirithorses uses the Japanese art of kumihimo to create her braided bracelet below. The beaded end caps really enhance her lightly dyed horsehair. Thanks Nancy for the tip! That jewelry rocks! 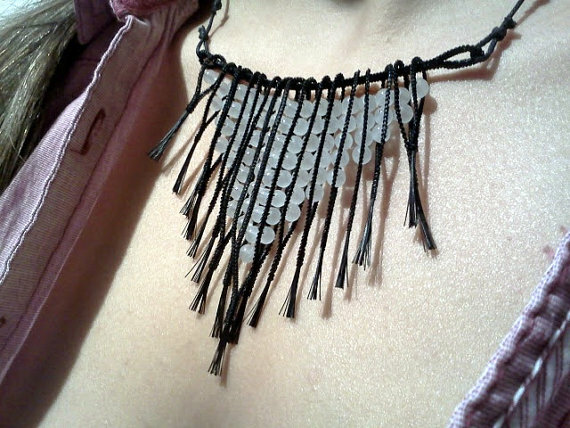 Amazing pieces! I only used to make woven horsehair rings as a kid. We all had them on a necklace, mostly from our favorite horse or from the horses we rode. Wonderful artistry! thanks so much for sharing it! I love the designs, amazing what you can do with horsehair. 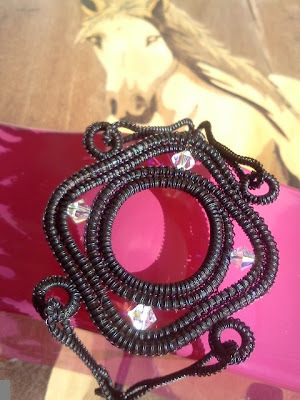 Want to make one for my daughter with the hair of her horse :) Hope she will keep it forever. Yes, I am pretty amazed to - I hadn't realized how wonderful they can be until I did the feature. I am sure your daughter will treasure it !